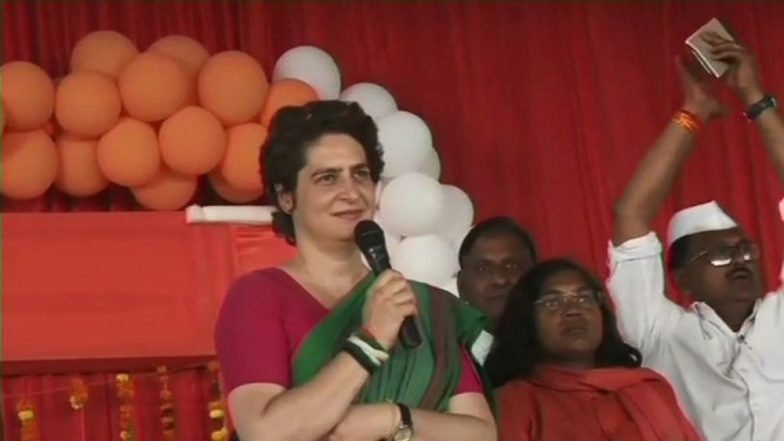 Prayagraj, March 18: Priyanka Gandhi, Congress's newly appointed General Secretary for Uttar Pradesh (East), began the Congress election campaign for 2019 Lok Sabha polls from the holy city of Prayagraj and commented on Prime Minister Narendra Modi's "Main Bhi Chowkidar" campaign on Twitter. Priyanka Gandhi targeted PM Narendra Modi's Chowkidar campaign and said that "chowkidar ameeron ke hote hain, Kisaano ke nahi" (only the rich get to employ guards, not the farmers). Lok Sabha Elections 2019: Priyanka Gandhi Vadra Says Indira Gandhi Asked Her to be Fearless. While Priyanka was speaking, the Congress supporters gathered at the rally also gave slogans of "Chowkidar Chor Hai", interrupting Priyanka's speech. Priyanka Gandhi Vadra Writes Open Letter to People of Uttar Pradesh, Vows to Change Face of Politics. While speaking to the reporters, Priyanka also said that the "PM can add whatever he wants to his name but yesterday I visited a farmer who told me that it's the rich who appoint chowkidar as we farmers are our own chowkidars." Priyanka Gandhi Vadra on Monday boarded a boat to start her three-day long Ganga Yatra from the Manaiya ghat in Prayagraj. "Ganga maiyaa will give us blessings. She is very generous,” Priyanka said while talking to reporters. Congress tweeted pictures of Priyanka Gandhi taking the boat ride in the holy river Ganga. She started the first day of Ganga Yatra by offering prayers at Bade Hanuman ji temple followed by a prayer at Triveni Sangam. She will be stopping at Dumdama ghat, Sirsa ghat, Lakshagriha ghat and Sitamarhi ghat in Sitamarhi district where she will stay for the night.Priyanka is accompanied by party spokesperson Akhilesh Pratap Singh, MLA Aradhana Mishra, MP Savitri Bai Phule and some students.